Life in Little Washington revolves around the water, and this extends to all forms of recreation, including the local parks. 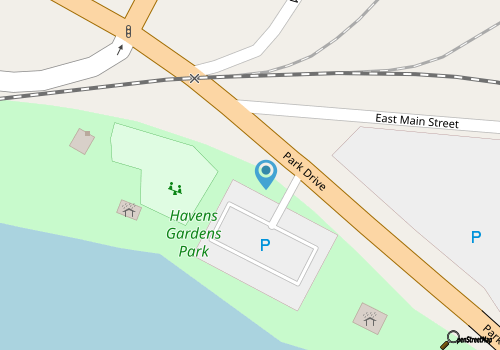 The Havens Garden Park is a peaceful retreat located just off of Park Drive and Washington's thriving downtown, and offers visitors a peaceful locale to relax, take in a sunset, do a little fishing, entertain their young ones, or all of the above. Free and open to the public year-round, the Havens Garden Park is a pretty, natural retreat in the heart of an otherwise bustling downtown Washington. The park is located along the Pamlico River, just before the Runyon Creek Bridge, and despite its relatively small size, offers a world of entertainment for active visitors. A sprawling grassy terrain is the ideal location for volleyball, tag football, or other outdoor games, and on-site playground equipment provides young visitors with an opportunity to enjoy the fresh air and expend a little extra energy. There are two covered picnic shelters overlooking the water which can be booked in advance by groups for a small fee. (There are no charges for Beaufort County school groups to use these facilities.) Reservations can be made by calling the main Parks and Recreation office at (252) 975-9367 ext. 221. One of the most popular activities within the park is fishing, and a small but optimally located fishing pier which extends out into the water is stationed right along the waterfront for anglers' enjoyment. The slightly-saltwater Pamlico River serves as the home for a wide variety of species, from small mouth bass to "baiting" mullet, and anglers can expect some exceptional fishing and crabbing conditions along the park's watery borders. Most alluring, however, are the views which span from the very edges of Washington across the river to the vehicular bridges and beyond. Sunset is a fantastic time to catch some fantastic open water views, with just a sliver of land peeking out on the other side of the river, and is also an ideal time to enjoy a romantic and relaxing end to a typical downtown Washington day. The park is open daily, from sunrise until sunset, and also features restroom facilities for park patrons. Restrooms are typically open from 9:00 am. until 5:30 p.m. in the shoulder season months, (spring and fall), and are open from 8:00 a.m. until 7:00 p.m. in the summer months, May through August. The restrooms are closed for the season November through March. A trip to the Havens Garden Park can entail a large group picnic or a romantic and relaxing sunset for two, and everything in between. With fantastic views, great fishing, and plenty of room to stretch out and enjoy the grassy terrain, visitors of all ages will find that the Havens Garden Park is the perfect spot to relax and enjoy a unique view of historic and scenic Little Washington.